This can be accomplished using a "Created Date" User Property for the user, or you can base it on whether a user has completed a certain flow (ie, the last flow) in the onboarding process. Like with new users, this can be time-based. But, you can also make it action-based, where a user has completed a set of items that allows them to "exit" the status of "onboarding". There's content only certain users can see (eg, adding a teammate), so flows can be targeted specifically to users who can actually complete a certain action. If you're releasing something that only existing users will know the difference, there's no reason to tell new users. Set up a Segment for the release so you only target users who existed before the release went live. The targeting conditions on a segment work exactly the same way as on a flow. To read more about user targeting, read our documentation on Targeting by Audience. Note: You can also create a segment directly from a flow you're working on. 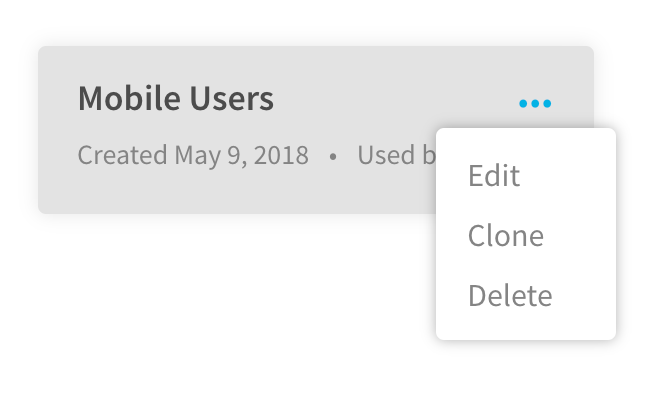 When setting up your audience for a specific flow on the Flow Settings (Targeting & Publish) screen, in the Audience section under "Specific users," you can click "Save as Segment" to name and save the rules you've set. The flow will then switch to use the segment you just created (see Using Segments below). To use a segment you've created previously, from the Flow Settings (or Targeting & Publish) screen in the Audience section, choose "Users in a Segment" then choose the segment for whom you want the flow to appear. The flow will now show only to users who match the criteria specified in the segment, with exactly the same result as if you had set those rules directly on the flow using "Specific users." You can see all your segments on the Segments page, as shown above. To delete a segment, click the ellipsis (•••) menu on the segment, then click Delete. Note: you can't delete segments that are connected to a flow. Please remove the segment from each flow on the flow's Settings page before deleting the segment. To edit a segment, just click it. You can then rename the segment or update the targeting rules just as you did when you created the segment. When saving an updated segment, all new targeting rules are applied to all flows which use that segment immediately. You do not need to republish any connected flows for the changes to take effect. You can also combine Segments with other segments and targeting options to show the right flows to the right group of people. In the 'Audience' section of the flow settings page, you'll notice a button that will allow you to 'Add Additional Criteria' to the targeting. The 'Specific Users' section will open where you can start to build on to the initial Segment you created. You can add as many additional properties as you'd like to the existing Targeting criteria, including additional Segments. Choose if you want to target those who fit, or don't fit in to the Segment that you're working with, by toggling between 'matches' and 'doesn't match' in the drop down. You can save the above group as a new Saved Segment as well (#meta), but keep in mind that any change to the Segment down the line will affect all flows that use it in the targeting. Can I use my Segment mashup in my goals? Does adding new properties change my original Segment? Nope! For example, the 'Existing (Non-New) Users' Segment and any flows that use it, will remain unchanged. To modify your original segment you'll need to update it from the 'Segments' tab. What if I change a Segment that is part of a Segment group? Those changes will instantly take effect on everything that uses that segment in targeting, so nothing has changed in this regard. For example: If I saved the above as a new Segment, a change to the 'Appcues Testers' group would affect this flow and any other flow that uses 'Appcues Testers' in the targeting.